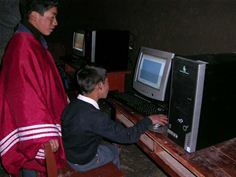 Aachen, Germany, December 19, 2017 – Aspera, worldwide provider of Software Asset Management solutions and services, has donated € 14,000 to the Practical Action project “Healthy Schools in Apurimac” in Peru. The project aims to improve student achievements at eight primary schools in the Apurimac region of Peru, through access to energy services, clean water, adequate sanitation and information technology. At Aspera, we simplify the complexity of your software licenses. For nearly two decades, we have helped hundreds of enterprises and over 50 Fortune 500s to assess cost and risk within their IT environments. Our solutions for Software Asset Management track all the big vendors, such as IBM, Microsoft, Oracle and SAP to cover every environment from servers and desktops to cloud and mobile. With the largest in-house consultant and service team in the industry, we provide the best strategy for data discovery, easy system integration, and a cost-effective way to purchase, use and optimize licenses. Aspera is part of USU Software AG (ISIN DE 000A0BVU28), which is listed in the Prime Standard segment of the Frankfurt Stock Exchange.